Xnet – group of activists working from 2008 for democracy, the right to know and against corruption – brings together this team in which some of the most prominent people and organisations fighting corruption in Catalonia will participate. It is not about creating a new group, it is about strengthening and federating the competences of the groups and individuals actives in the field. Here we are because finished governments, trenched behind penal codes and laws designed to punish those who fight and build and to facilitate impunity for the corrupt, can be defeated defending and making a collective and relentless use of our right to know and inform. Xnet, with Simona Levi, Sergio Salgado and Pau López will manage the coordination and representation. Xnet will also offer their Xnet’s Mailbox for leaks on corruption that will collect relevant information sent by citizens. David Fernández, as president of the Parliamentary Commission on the “Pujol Case” and CUP-Parliament‘s deputy, will coordinate the work around the parliamentary commission on the “Pujol Case”. This work will continue at a citizen level, even when elections are called. 15MpaRato‘s activists will be responsible for the coordination and dissemination of the legal strategy. Cafè amb Llet as experts in the fight against corruption within the healthcare sector. FAVB (Federation of neighbourhood associations in Barcelona) member and an example of citizen monitoring of corruption in cases like the “Palau Case” and corruption in Ciutat Vella. Rafa Burgos, journalist and writer, author of “Crema Catalana. Amiguismo, corrupción y otras miserias” (Icaria Editorial) and “La Casta. Quiénes son y cómo actúan” (El viejo topo) where he explains, ironicaly but strictly sticking to the truth, everything banks, monarchy, business schools and the media want to hide from us. With the collaboration of the Anticorruption Commission of the Anti-Corruption Commission of the X Party (Partido X) for theis competences and suppor networks very actives in this field. The team of activists, journalists, auditors, consultants and lawyers from the Xnet’s Mailbox. 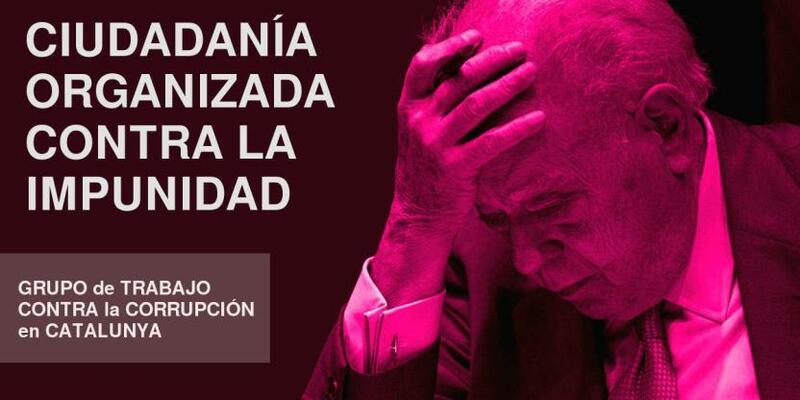 Take over the Parliamentary Commission on the “Pujol Case” (placing it in the hands of citizens), which will be interrupted by the electoral process. Make it clear that #Citizensdidit #LaCiudadaníaLoHizo. It has not been the Spanish or the Catalan government, nor the political parties. All this has not happened by chance. If we are dismantling the corruption networks in Spain it has been thanks to the work done by organised citizens. Optimise the work of all the actors who are part of Catalonia’s Citizen Group Against Corruption to accelerate the process where possible. Amplify public pressure against accomplice institutions and support the work of public servants who, on the contrary, do their work honestly. Ensure the right of access to information for the public and provide channels for citizen collaboration, such as the Xnet’s Mailbox for leaks against corruption. Help and protect the citizens who decide to expose corruption. We invite all citizens to contribute to this group’s work by providing information through the Xnet’s Mailbox. We will do our job through concrete actions.